Chrionex: Those with good hearts, Will always see the best in you and will happily tolerate your worst. They know when you're down and will always be there for you. They are happy with the love they feel they’ve worked for, while you take their love you feel is due. 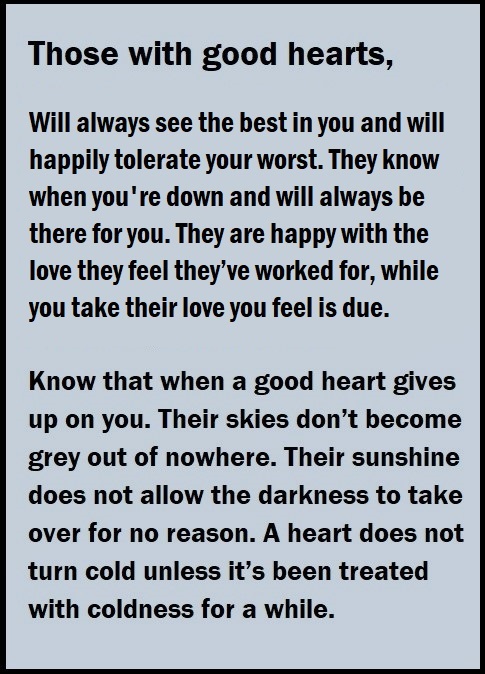 Know that when a good heart gives up on you. Their skies don’t become grey out of nowhere. Their sunshine does not allow the darkness to take over for no reason. A heart does not turn cold unless it’s been treated with coldness for a while.